For this week’s Photo Challenge of Unique, I chose to revisit an unrivaled destination that took my breath away. Colombia will most definitely become known for the treasures that she keeps tucked far away from the popular tourist destinations. One of these gems is El Cocuy National Park. It is approximately 10 hours away from the nearest transportation hub and is a hefty commitment for travelers to make. The pure isolation of this park is part of the reason it has been under the radar for so long. Historically it was used by the Guerrillas for their operations due to it’s pure ruggedness and natural barriers it kept with the outside world. The park itself has beautiful, glacier capped peaks with a wide assortment of pristine glacial lagoons that literally make you appreciate nature like never before. At altitudes ranging from 12,000 – 17,000 feet it will certainly take your breath away. At these altitudes unique plants sprout out of the ground in some of the valleys found in the mountains. One specific area was covered with thousands of these odd, martian looking plants called Frailejones. The local farmers who live within the park’s limits use them as building materials for their homes and buildings. Set against the drop dead gorgeous backdrop of the mountains shrouded with clouds it was one of the most unique places I’ve ever been to. Hope you enjoy them as much as I did! Unique all right. Love how the clouds shadow the ground. Would like to see how the frailejones are used to build. I’ll see if I can dig up a picture for you. They basically chop off the tops and use them like logs for the walls of a building. They are surprisingly spongey, and do provide some sort of insulation but most houses in this part of the world are open to the elements and not insulated at all. Thanks for comment! Ethereal. Other-worldly. Absolutely stunning. Yes, unique, too. That’s an amazing place, not like anything I’ve seen where I live. Even the green seems to be different. Everything looked different up there! The light was incredibly pure and the colors soaked up it’s rays. Part of the joys of seeing new places. Beautiful! 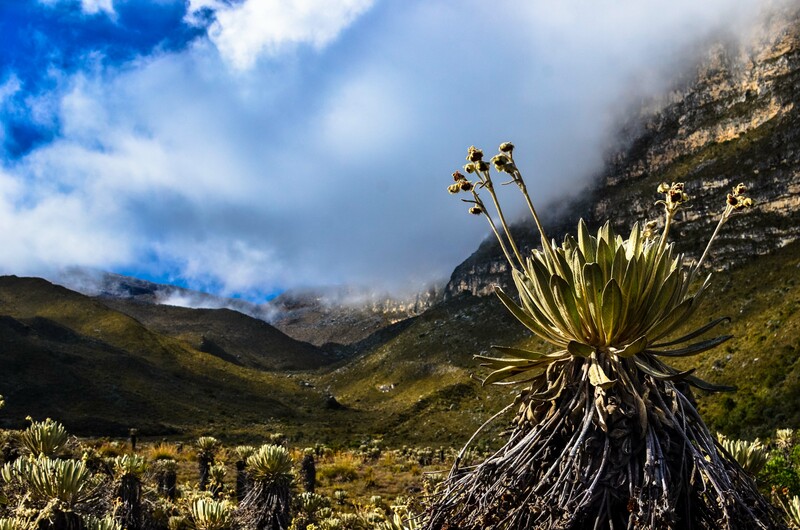 We’ve been lucky enough to see these frailejones hiking in Venezuela, specifically up in the Venezuelan Andes not far from Merida. I hear they make a good toilet paper in a pinch! Here’s a super close-up of one I took a few years ago… http://bit.ly/XhThga . I have yet to try them as natural toilet paper, but I’ll take your word for it! I heard Venezuela has an immense amount of beauty held within it’s mountain passages as well. Thank you! I find that most images are hard to define with only one word. This one surely fits that mold! I will just have to travel there vicariously through you. Nice to know some places are hard to get to and worth every bit of the effort. Yes, definitely unique area. Would love to see a photo of the houses made from the plant material. Interesting. Nothing goes to waste. Fantastic photo. I’ve got to make it out to South America one of these days. That area reminds me a bit of the Great Basin in the US, where mountains and the high desert mix. Beautiful shot. The cloud with the sunshine really gives it depth. It is hard to capture the enormity of spaces in photos sometimes, but this one nails it! Love your stuff on Instagram too.